Consider for a moment that you’re on a treadmill (even if that notion seems far-fetched, go with it for the sake of the point I’m trying to make). So you’re on this torture device for a half hour sweating, and you’re tired. You grab your smart phone, wave it over your thigh and, lo and behold, it tells you how much fluid to drink to replenish what you’ve lost. If you don’t like the exercise example, let’s say you’re lying on the beach or by the pool with a cool drink relaxing and soaking up the sunshine. You reach for the smart phone wave it over your arm and it shows you whether the sunscreen you slapped on a few hours ago is still working. If you think that’s pretty cool, how about I tell you that the same technology could monitor your baby’s temperature and heartbeat while she’s sleeping. Or that the ultimate vision for this sensing technology is that one day a doctor will take a minimally invasive device—if you need it—go in through your femoral artery, up into the atrium or ventricle of your heart, and deploy a thin conformal monitoring device that would give you and your doctor real-time information as to what’s happening inside of you. None of this is farfetched at all. This particular biometric monitoring technology comes from the labs of MC10, a Cambridge, Mass., company that late last year signed a deal with sports equipment-maker Reebok to work on helmet-impact indicators and other sensing devices for professional athletes and the casual ones, like you and me. Same technology used for different applications—that’s smart. But the innovation happened when the founders of the company conceived of taking high-performance microchips out of their rigid boxy packages and molded them to conform to the human body—like an electronic tattoo. Rightfully, David Icke, the CEO at MC10, whom I met at a conference at the Massachusetts Institute of Technology last fall, is inspiring a legion of supporters. He said his company wants to redefine the interface between electronics and the human body to make “humans more superhuman.” The manufacturing process that gives the chip its flexibility is both electrical and mechanical, he said. MC10 and other innovative companies that drive transformative technologies embrace the concept of being agile and react to market needs. 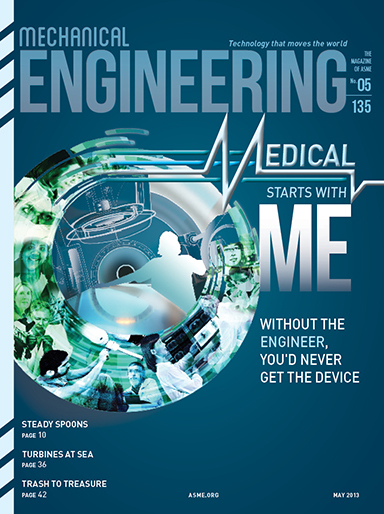 Much like the organizations we spoke with for this month’s cover story (“Medical Starts with ME,” page 30), which are also blending technology and medicine, MC10, said Icke, relies on the diversity and ingenuity that its employees bring to the design process. Realizing the strength of this diversity and understanding that, for many, creativity is not a linear process keep companies inspired and innovators motivated. Dean Kamen, for example, who is an inventor and no stranger to the development of mechanical systems for medical applications (“One-On-One” with Dean Kamen, page 22), has been revolutionizing attitudes about the engineering workforce for decades. He has kept himself inspired by a drive no less imposing than that to improve the world. “I don’t work on a project unless I believe that it will dramatically improve life for a bunch of people,” he once boasted. The likes of Kamen understand that innovation is a driver to change, and that technology is an uncompromising tool. Gameplay: Same as other online games, this game emphasizes teamwork to win the battle against powerful enemies. entertainment is not charged it is of poor quality. I know this web site presents quality depending articles and extra stuff, is there any other website which offers such things in quality? I think that this is a impressive page you got there. that were deep in my carpets in which i was successful. would raise the price on the day of the shift and cause scuffles. the moving service provides the facility of a trailer. cause illness and aggravate any dust related allergies. our uninvited guests. your family, especially children, your friends, your pets and yourself. avoiding the extra expenditure involved. Better the risk you know about than those you can’t see coming. with a selection of the best self tanners available at unbeatable prices. There’s the oar to the left, which is in the corner. be addressed in order to stop the mold from growing further. Come to think of it, vinegar is specifically made for cooking and flavoring, not for molds. moisture content that molds, mildews, and bacteria like to grow. more expensive the longer it spreads. been to the toilet and did not feel like peeing any more. Confident of ample wisdom, Fred said, “We’ve camped. Remember though, fish doesn’t get better with age – use it or lose it. While these are the major things represented on the control board, you unit may have additional items represented, including surface clutter, structure, second returns and thermoclines. want to fix it in your clean upwards shower to be able to spray the organic spray tan solution over your own skins external surface to get a bronze shine. training to individuals who wish to start an Airbrush Tanning Business. This keep stain from getting in your eyes and building up on your eye creases. lotion may rub off on your clothes. Simply said, this leads to skin damage if not properly protected. I’m blogging about right now. Effectively, I’ve discovered a way to get gorgeous wedding gowns and even designer wedding gowns for a fraction of the original price. Joan Thompson is surely an independent researcher and writer. experiences as well as energetic residue is quite toxic. It also increases the device to be able to sort through data that remains more quickly. I’ve read stuff from. Thank you for posting when you’ve got the opportunity, Guess I will just bookmark this web site. style. The Unitron website includes detailed description of the features and benefits from this product.